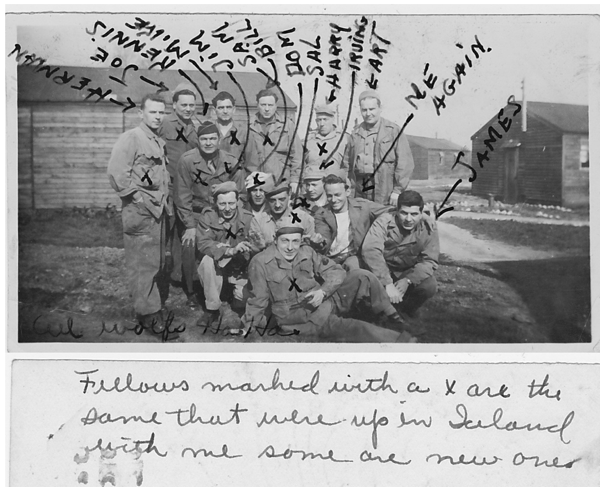 If it were not for Ziggy and Alveda's faithful writing and their enclosed photos, we would have no record of what transpired with Ziggy's military sojourn. Somehow, a large amount of WWII army records were lost in a 1976 fire, Ziggy's included. Hopefully, government agencies are more careful today with archival storage of these precious records. There are probably more records of the Civil War! But, we do have these precious documents. on to Camp Miles Standish to ready for embarkation, where he met Alveda. His first stop after that, as we know, was Iceland. and American troops by Winston Churchill. 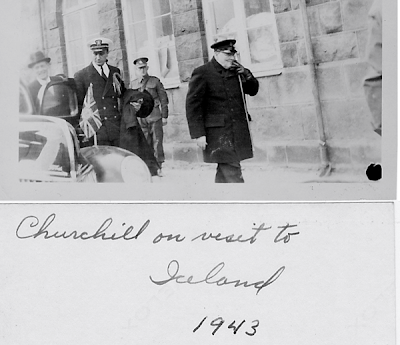 Ziggy himself dates this photograph 1943.
was in neutral Iceland was in 1941 when he met FDR on a yacht moored nearby. So Ziggy might have had a jump on historians.....or not. Ziggy's orders found him next in France as he followed his WWII destiny. 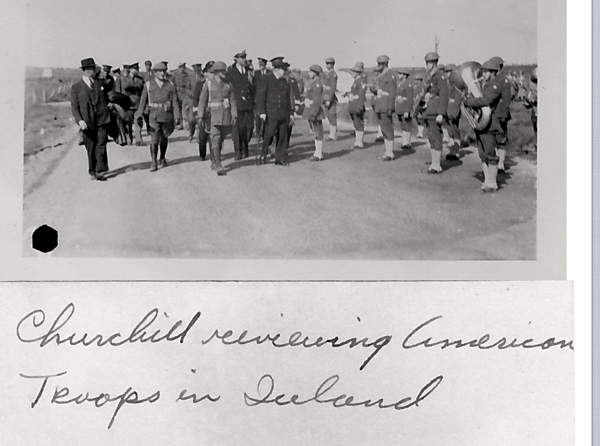 Here he is with a bunch of guys, some of whom had served with him in Iceland. Ziggy notes that those fellows are marked with an X. Wouldn't it be wonderful if someone recognized a loved one? Did all of them return.....? This is for sure in France where Ziggy would be wounded by shrapnel fire in both ankles, suffering severe burns. We do not know any other details: just the fact that the pain and scars bothered him his whole life. He must have recouperated enough because, as we shall see, he stayed over there with his outfit. The writing across the sea continued and there is little doubt that Ziggy shared the photos of his lovely sweetheart with his mates. 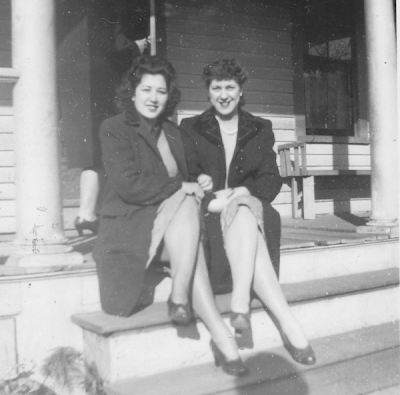 Here is Alveda (left) with a good friend on the front stoop of the Souza home on School Street sending him a warm smile of home and hope for better days. 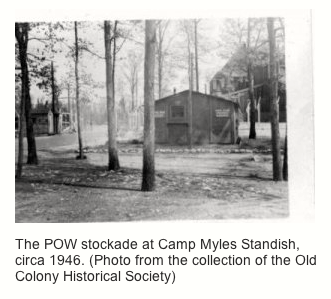 Meanwhile, Camp Miles Standish now included a German and Italian prisoner of war camp. Once Italy was out of the war, Italian prisoners were allowed a bit more more freedom and could leave the camp on their own to visit Italian families in the Taunton area.
" Taunton buses would stop at the gate and then at two holes in the fence." They could even be seen walking around the downtown area. Germans were kept confined under 24 hour guard and were marched to meals. A friend tells me her mother forbade her to wave to any of the prisoners. The Camp continued to play a big part in the Village and Taunton social scene. where they were part of the U.S.O. The children in the Village knew the camp,too, another Village alumni tells us, since the army trucks traveling from the Camp would lumber down Purchase Street. No one knew where they were going, but the kids would rush to the corner of Wilbur and Purchase so that the soldiers could wave to them. I've been surfing online more than three hours lately, but I never discovered any attention-grabbing article like yours. It is beautiful value enough for me. In my opinion, if all website owners and bloggers made just right content material as you probably did, the web will likely be a lot more useful than ever before.